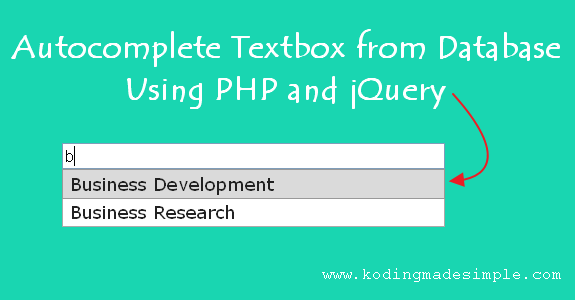 Hi, this post will show you to Create Autocomplete Textbox from Database in PHP, jQuery and MySQL. Autocomplete search is a feature that suggests the list of available options for selection based on the characters keyed in by the user. By implementing this autocomplete search feature to a text box in web forms, we can save the user from typing the complete set of words and let them pick out their choice by entering few characters instead. To implement autocomplete feature to textbox, we need jQueryUI Plugin. First download jquery ui plugin and extract its files to your working folder. Make sure you have both jquery ui's "css" and "js" files in place. The jquery ui plugin requires jquery library for it to work. So download jquery file and move it to the same working folder. Having everything in place, now let's move on to integrate autocomplete feature in php. Here goes the process. I have a MySQL Database, "employee" with a table named "department". This department table stores the list of department names. Now I have a html form which requires the user to input department names. Here is what I want to bring in the autocomplete feature. That I want to pull off the entire department names from the database and to use it as a suggestion list for the department name input field. Let us see how to do this in php and jquery. Create a file with name "autocomplete.php" to fetch all the department names from the database and convert and echo them as a json string (list of department names separated by commas). Here goes the php code to fetch the data from database for autocompletion. The php json_encode() function will convert the array values to json string of comma (,) separated values. Next create another file "demo.php". This is where we will have the textbox and use the "autocomplete.php" file to integrate auto complete feature. First include the required css and js files inside the <head></head> section. Next add the input textbox field within <body></body> section. Finally use jquery ui's autocomplete() method to add list of department names to the textbox as suggestions. Here is the js script for doing it. Now run the file and type in the textbox. As soon as you type in the textbox you can see suggestions popping out below the textbox field like this. Here goes the complete code for the above implementation. And that explains implementing autocomplete textbox from database using php and jquery. You can easily implement this feature to web forms by using this method. I hope you have enjoyed this autocomplete textbox in php tutorial. If you don't like using jquery library for auto suggest feature, there's an option called Datalist in HTML5. With this you can easily implement autocomplete textbox in php. You can check here for the tutorial. Hi, either you don't get the proper ajax response or the dropdown element id should be wrong. Just debug and see if the json string is what you are expecting. Hi! You can use a select box or option group with multiple options (like countries visited) and when the user selects one of the options, make ajax call to populate the autocomplete textbox with results based upon your queries. Hi Valli - I think I'm close to getting this to work. I've followed your instruction and edited where necessary for my db structure and file paths, but do not get the suggested list yet. There's a link on the page: "fetch the data from database". I'm not sure how to use that since it seems the data is already pulled in and stored in an array ($dname_list) with the autocomplete.php file. Am I misunderstanding that link? Hi William, regarding the link you have mentioned, it's a different article. To autocomplete textbox you only have to follow the code given in this article. Thanks. I found the error - works now! Glad you got it fixed! Cheers. If I want to list the members of a team, how would I modify this so I could could select 4 diferent names using the auto-suggest function? Hi, I want to autocomplete for two field in database like "Select * from department where department name Like '%name%' AND floor = '$floor' but it still doesn't work. how to add links as results? I need to pass a couple of variables to autocomplete.php for the SQL query ... how should I handle that ? Thoughts how I do this ? These already are present in the page where my form is. autocomplete() method has an option 'extraParams' to pass parameters. Try using it! how to get both department name and department_id from database as per the program above. You can try concatenating dept id and name as a single value and populate the textbox. thanks for your post, it works perfectly. Just one thing, I noted that to autocomplete you must start typing exactly the db data, it i not searching for similar strings to compare what you type and what options are on db. Is is complicate to implement? The script is usefull if you know perfectly how to start typing but when you have for example 35 potential padidates on db field is not easy to remember. Hi! What do you mean by saying you have to type the exact data from db? As soon as you start typing, it pops out suggestions containing the similar string or even a char for that matter. Say you type 's', then you will get a list of suggestions that contains the char 's' and so on. This method is good and fast if you have to work with small subset of data. For larger datasets, you have to use ajax calls to pull off data from db. This is the method search engines like google use. You can check this tutorial if you want to try it. I hope that clarifies your doubt. Hi Valli, sorry, you are absoletly right, it was my mistake trying to modify the code, :(. Maybe you can help me on this issue, I used the code to show in a form the text of one option, I mean, I have a tasks table and other task to define status, so in the form I use this code to show the task status description and not the ID. So easier for the user. But I have a basic proble I do not know how to solve. If I select the text privided by the script, them the db is not full with data caming from this field because is expected to receive 1, 2, 3 or 4 and status ID and not one text. Any recomendation from your side? I´m a little bit lost, learning PHP and others by my side, :). Thanks in advance. I modified the CSS to highlight the search term. prevents my others js file from functioning.. why is that so? any idea? thanks. Is it possible to highlight the search term in the results? Is it possible to highlight the search term? Seem to be getting the error: "Expected a ':' following the property name 'var'." Seem to be getting the error: Expected a ':' following the property name 'var'.